A wise person once said it’s what’s on the inside that counts, and for local families looking for pediatric care close to home, the new Akron Children’s health center in Mansfield doesn’t disappoint. The 32,350 square-foot facility, which is designed to offer an array of services for babies, kids and teens, is every bit as state-of-the-art as it is kid-friendly. It is located at 1029 S. Trimble Road, Mansfield. The building features pediatric primary care, urgent care and rehabilitation services including physical, occupational and speech therapy, as well as specialty services such as allergy/immunology, cardiology, gastroenterology, hemostasis and thrombosis, nephrology, orthopedics, urology and maternal fetal medicine for high-risk moms and babies. Patients will also have the convenience of radiology and laboratory services on site. The new Akron Children’s Hospital Pediatrics primary care office will bring two locations (currently in Mansfield and Ontario) into one office space that features 26 exam rooms. Physicians from the two offices will begin seeing patients in the health center starting March 26 when office hours will be 7 a.m. – 8 p.m. Monday through Wednesday, 8 a.m. – 8 p.m. Thursday, 8 a.m. – 5 p.m. Friday and 8:30 –noon on Saturday. The Akron Children’s Urgent Care features 6 exam rooms, with access to additional patient rooms as needed, x-ray, point-of-care lab testing and EKG. About 6,600 square-feet of space is dedicated to rehabilitation services. The space has 6 therapy rooms and 1,400 square-feet of gym space for exercise, sensory integration and gross motor skills. It also features an indoor track that has access to an outdoor path for rehab bikes and tricycles. Additional specialty services will encompass 12 exam rooms that feature a flexible design to allow the various specialties to function in the same space. Specialties also have access to cardiac ultrasound, echocardiography, EKG and a procedure room. Maternal fetal medicine (MFM) focuses not only on baby, but also high-risk moms. Thanks to the flexible design of the space, adult patients have access to 3 exam rooms, 2 ultrasound rooms and a separate waiting space, if needed. MFM specialists will provide moms with consultation, ultrasound services and other specialized care such as diabetes management in pregnancy. Specialty services will begin seeing patients March 25. 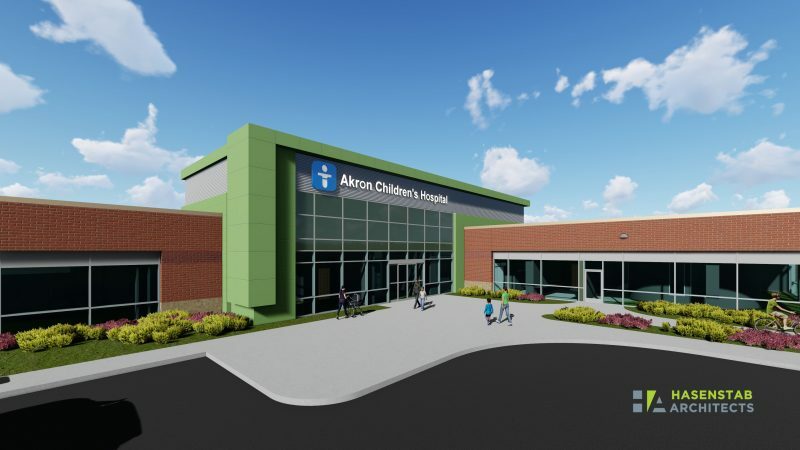 The community is invited to get a sneak peek of the new Akron Children’s Health Center, Mansfield on Saturday, March 23 from 9:30 a.m. – noon with a ribbon-cutting ceremony at 11 a.m. The event is free and open to the public and features self-guided tours, light refreshments and family entertainment.